Experience the world’s most consistent year-round fishing for bonefish and trevally with skilled, warm-hearted guides with typical air temperatures ranging from 73-84 degrees. The fact that virtually every fly angler in North America has heard of Christmas Island is far from coincidence. Amidst the vast inventory of the world’s saltwater destinations, Christmas Island is a unique and natural masterpiece that magically combines all the elements critical to fly fishing success. Endless hard sand flats, remarkable numbers of cruising bonefish and trevally, and consistent year-round weather await all who visit this unique atoll. Guides at Christmas Island Outfitters have been handpicked for their overall level of experience and skill, calmness under pressure, and instructional abilities. Each day anglers will depart via truck or catamaran for the day’s fishing. Virtually all fishing entails sight casting to visible fish while wading in shallow water. Christmas Island’s plentiful bonefish average 2 to 4 pounds, though each week presents numerous opportunities for larger specimens in the 5 to 10 pound class. 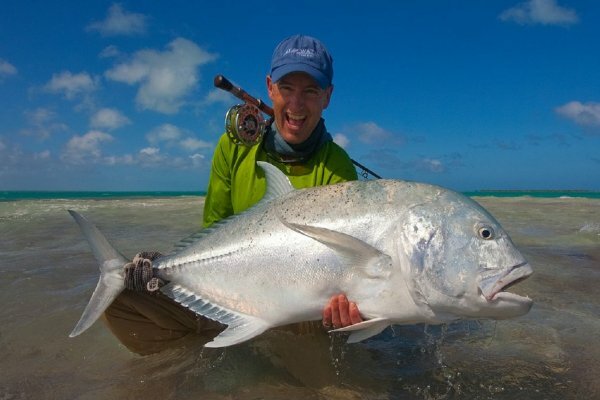 The guides at Christmas Island Outfitters are also among the atoll’s most skilled and passionate trevally hunters and love nothing more than to share with their guests the thrill of hooking these monsters. Excellent blue water fishing for tuna, wahoo, and trevally is also available. Catering to groups of eight to twelve anglers per week, accommodations at Christmas Island Outfitters consist of seven private bungalows that sleep two anglers each. Rooms are simple, clean and spacious and have private baths, fans, screened windows, and refrigerators. The common meeting area features a friendly bar and a casual dining area where fresh, simple meals are served in the morning and evening hours. Flexible by design to ensure quality fishing, the daily schedule and meal times at Christmas Island Outfitters often vary slightly in order to take advantage of the best tides and fishing conditions. Christmas Island (Kiribati) is located 1,200 miles south of Hawaii, just under 3 hour south of Hawaii and 144 miles north of the equator. 12 angler capacity offering a 7 night/6 day package. All guides at Christmas Island Outfitters have been hand picked for their overall level of experience and skill, calmness under pressure, and instructional abilities. We feel that visitors will be hard pressed to find a better crew of saltwater fly-fishing guides anywhere in the world. Each day anglers will depart via truck or catamaran for the day’s fishing. While standard packages include one guide for every two anglers, one on one guiding is available at a reasonable additional cost. Virtually all fishing will be done while wading and entails sight casting to visible fish in shallow water. Christmas Island’s plentiful bonefish average 2-4 pounds with each week presenting numerous opportunities at larger specimens in the 5-10 pound class.